Just started following on Twitter. I really enjoy reading about the minor league cards lately. 1. So many good players from the 1960s. I'd pick Earl Wilson from that era, but I didn't 'discover' him until a few years ago. I'd have to go with Carl Yastrzemski as a player I saw in the 1960s. I always liked the Red Sox in the late 60s and early 70s. 3. Will more than likely pimp at some point today. Mantle is hands down my favorite player from that era. Perhaps a generic/common answer, but the truth. He is followed closely by Rizzuto. 3. I'll do it later. 1. Bob Feller, though he didn't play in the '60s, so you could throw Pete Rose in there too. 2&3 - Don't tweet, blog hasn't been getting any love, so I'll settle for one entry. 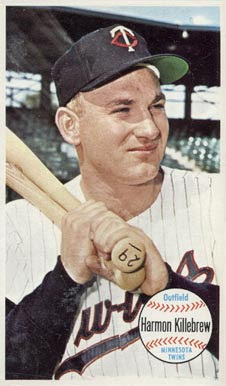 no 50's "favorite" for me, since the Twins started in '61. Have to go with Rod Carew. I don't really play favorites, Matt, but if I did...Mantle would be the safe choice. However, the quirky side of me would say Mossi, while the fan in me would say Aaron, and then there's Yaz, who I actually watched play. I love contests with easy questions. Koufax. From the time I was a 4th grader in 1975. Not only a great player but a great man. I'd retweet if I tweeted. I would have to go with Mantle, Berra, and Rizzuto since the Mets werent born til 1962. 2. Iam now following you on Twitter (@dgreen1899), and I have retweeted about your contest. Roberto Clemente, no question. I just wish I had the chance to see him play. Not being alive during this time, I don't know if I have a clear answer. However, being a huge Padres fan, I'll cheat a little bit and say Nate Colbert. He was on the inaugural Pads team in 1969, just barely qualifying for the '60s. He still holds the record for most career home runs as a Padre. His '69 Topps card is one of my all-time favorites. I will go with The Bob Gibson. I would like to mention your contest on my blog pages, but I am too busy trying to prove to Google that I am not a robot to remember how to update it at the moment. If I get a chance, I will. Sandy Koufax was a God back then and still is today. Johnny Podres is also one of my favorites, mostly due to his pitching in the 1955 World Series. I'll have to go with Koufax as well. Stan Musial, or Stengel as a manager. I dont know much about tweeting. You have now been pimped! Thanks for the contest. My favorite and my son's would be Willie Stsrgell. I RT'd and have followed for long time. you know what? i will go with don drysdale over koufax. Tough question, I'll go with Roger Maris, Al Kaline, or Norm Cash. Here's the link to my blog and a contest shoutout. Add that my favorite player is Alan Trammmell. How did we get to 35 comments with no mention of Willie Mays? It's good ole Mickey Mantle for me. You know, the whole #7 Jersey thing. Oh, and Dawgs don't tweet, tweety boids is for puddy tats. Happy 4th, keep up the good blogging! As a Cardinals fan I'll have to say Stan Musial, with Red Schoendienst shortly behind. My favorite player from that era is Carl Yastrzemski. I missed the cutoff but I have to mention my favorite player of the era, Billy Pierce.